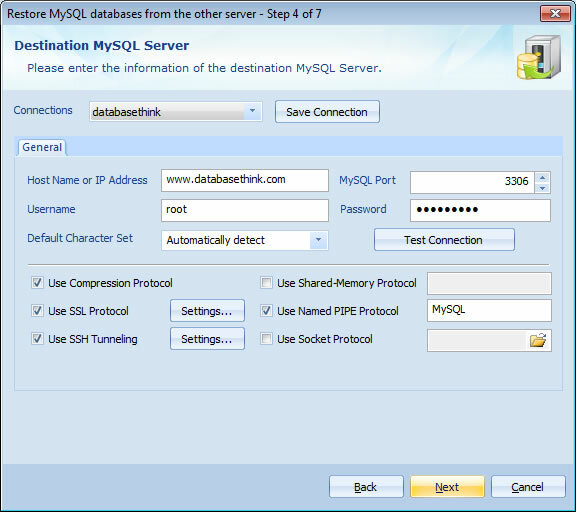 Automatically restore MySQL databases from sql files to remote / local MySQL server. Automatically restore MySQL databases from sql files to remote / local MySQL server. Ability to select MySQL databases from the SQL backup files before recovery (Reverse Parse). Automatic Backup Scheduler for MySQL > Tutorials > Automatically restore MySQL databases from sql files to remote / local MySQL server. If you want to restore MySQL database from the sql files, you can try the software Automatic Backup Scheduler for MySQL. It can help you restore the sql files to the remote / local MySQL server on schedule. With Intelligent Selection of backup files, the software will automatically remove the duplicate files, add the related backup files of the selected incremental / differential backup file, and automatically search the valid backup file ( *.sql, *.zip, *.gz, etc. ) from the selected folder and subfolder. With Reverse Parse, you can choose to restore a part of the MySQL database from the sql file before recovery. Step 2: Launch the software and create a task to Restore MySQL databases from the backup files. Create a task to Restore MySQL databases from the backup files. 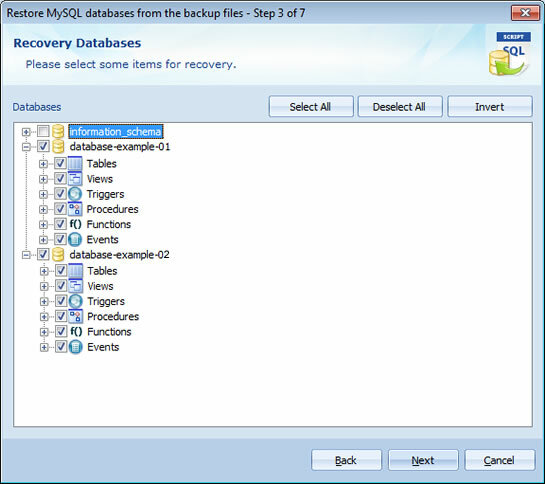 Step 3: Select the sql files and items for recovery. Please add the backup files ( *.sql, *.zip, *.gz, etc. ) to the list for recovery on Step 2 of the Task Wizard and click Next. Please click Add Files button to choose the backup files for recovery. The duplicate files will be removed from the list before adding. If you add an incremental/differential backup file, the software will automatically add the related backup files to the list. Please click Add a Folder button to choose a folder for recovery. The software will automatically search the vaild backup files ( *.sql, *.zip, *.gz, etc. ) from the folder and subfolders and add them to the list. The duplicate files will be removed from the list before adding. If the selected ZIP file is encrypted, please click the password button to enter the password. If you choose the option Restore databases from ALL items in the backup files, all items in the backup files will be restored. You will view the backup files on Step 3 of the Task Wizard. If you choose the option Select some items in the backup files for recovery, the software will Reverse Parse the backup files and extract the database structures from them. 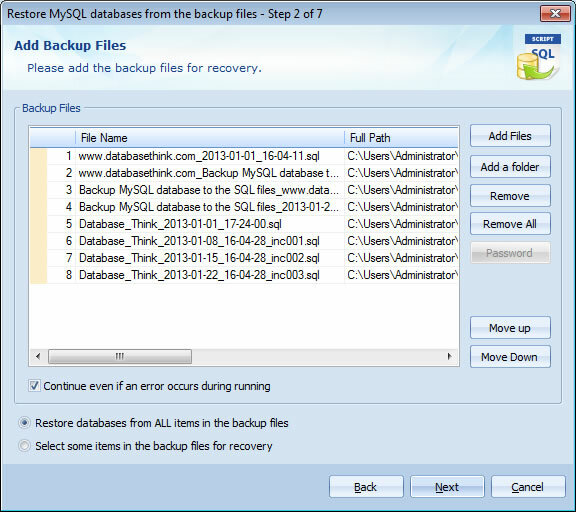 You can select the databases and items to restore from the backup files. And you can select the items on Step 3 of the Task Wizard. Read more about add backup files for recovery. Please enter the information of the destination MySQL server. Read more about connect to the destination MySQL server. Please click Next and choose the Task Scheduler for running the task on Step 6 of Task Wizard to restore the backup files to MySQL server on schedule. That's all. The software will automatically restore MySQL databases from the selected sql files to the destination MySQL server.